Canada has emerged as a front-runner in AI development. The country has declared a national initiative around AI, pouring hundreds of millions of dollars into it and relaxing immigration rules to attract the best engineers. Canadian Prime Minister Pierre Trudeau appeared at MIT’s Solve event in May. Canada has a number of strengths that position the country well in AI, including a growing supply of Ph.D-level AI engineers in an era characterized by an acute global shortage of AI talent. This is largely due to leading universities in Toronto, Waterloo, Montreal and Edmonton that have invested heavily in AI research for years. “Canada now has one of the most significant concentrations of AI talent anywhere,” stated Salim Teja, venture capitalist with MaRS, an innovation hub in Toronto, writing recently in Forbes. Graduates from Canada have gone on to lead labs in the world’s top technology companies. They include: Geoffrey Hinton, VP and Engineering Fellow at the AI research team Google Brain, which also includes many other Canadians as senior researchers; Craig Boutilier, principal scientist at Google Research, which was recently renamed to Google AI; Alex Graves and Yujia Li, senior researchers at Google DeepMind, the AI research unit based in London, acquired by Google in 2014; Ilya Sutskever, co-founder and research director at Open AI, the non-profit AI research company that aims to promote “friendly AI;” Rusian Salakhutdinov, director of AI Research at Apple and a computer science professor at Carnegie Mellon University; Yann LeCun, VP and Chief AI Scientist at Facebook; and Nebojsa Jojic, Principal Researcher at Microsoft Research. Google’s DeepMind, which developed the first software to defeat a human player in the strategy board game Go, has opened its first lab outside of the UK in Edmonton. Microsoft in early 2017 acquired Maluuba, a Montreal and Waterloo-based startup specializing in machine language understanding. Microsoft plans to double the size of the company’s Montreal office by 2019. Tech Mahindra, an IT services firm based in India, announced in February 2018 it will invest $100 million in a Centre of Excellence in Toronto. The center plans to jointly develop business solutions in emerging technologies including AI with academic institutes, innovators and accelerators in the Canadian startup ecosystem. Canada’s Prime Minister Pierre Trudeau recently traveled to India to promote enhance bilateral collaboration between the two countries. Canada also has vast amounts of data, by virtue of its publicly-funded systems in services including health, energy and transit. “These large datasets are goldminds for AI developers, not only because of their size but also because of their diversity,” states Teja. Canadian diversity is a strength when it comes to address bias in AI datasets. In Toronto, more than 50% of the population is foreign-born. Rather than trying to poach the best AI academics, startups and corporations in Canada are creating partnerships with universities that enable the researchers to stay involved in academia as well as industry. For example, the Royal Bank of Canada has created Borealis AI, a subsidiary that gives its staff latitude to collaborate with universities on research and jointly publish results. In Montreal, Element AI is a venture founded by neural network pioneer Yoshua Bengio, working with University of Montreal (see recent AI Trends interview here) and McGill University researchers to jointly advance algorithms for companies looking to incorporate AI solutions into their business. PWC estimates that AI will add $19.4 trillion to the global economy by 2030. Canada sees AI as its biggest opportunity to expand its economy, alleviate its dependence on natural resources, evolve to new technology-driven industries and create a prosperous future, writes Steve Irvine recently in the Toronto Globe and Mail. Irvine in early 2017 left an executive role at Facebook to return to Canada and build integrate.ai, an AI-focused startup where he is the CEO. In 2017, Canada invested more than $300 million in new funding for research and Canadian startups raised $260 million. In addition to DeepMind, global tech giants Facebook, Samsung and Uber have established AI research labs in Canada. Canada faces competition for AI leadership. The US remains home to the world’s leading AI companies including Google, Facebook, Apple, Amazon, many well-funded startups and strong universities including MIT, Stanford and Carnegie Mellon. China plans to be a world AI leader by 2030; China recently committed $2.5 billion to a national AI research park in Beijing with a goal of supporting 400 companies producing revenue of $9.8 billion annually. With its own technology giants Alibaba, Tencent and Baidu, and its large population, China is well-positioned to capture a large share of the global AI market opportunity. China seemed to mimic the Obama-era roadmap laid out in 2016 for AI leadership. As the New York Times reported in February 2018, the Trump White House has been silent on a national AI strategy. ‘We are still waiting on the White House to provide some direction” on how to respond to the competition, stated Tim Hwang, who worked at AI policy at Google and is now the director of the Ethics and Governance of AI Initiative, an organization created by LinkedIn founder Reid Hoffman and others to fund ethical research in AI. Canada on the other hand is marshalling its national leadership to lead the charge. “It is essential that Canada shifts its focus more aggressively to commercialization from academic prowess,” states Irvine. Canada today lacks the homegrown, global-leading technology companies that can capture the economic growth associated with the opportunity. “We need at least a handful of $10-billion-plus companies to help create the commercial density and global relevant needed to attract and retain elite talent, create new high-value jobs and capture economic gain,” Irvine stated. 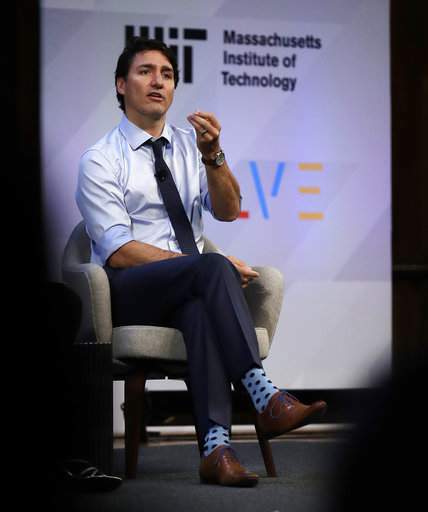 He encouraged Canadian businesses to commit to AI projects engaging startups to tackle meaningful business problems, to put strong people on it, and not tie them up for months with legal and procurement issues. “There is no better learning agenda for your team than rolling up their sleeve and seeing this new technology in practice delivering results for you,” he states. The Canadian government recently hosted journalists including Eliot Weinman, Executive Editor of AI Trends, on a tour of Canada to learn about the country’s accomplishments and opportunities in AI. The group visited universities and companies, and heard from experts in AI development and research, from innovators at AI startups and executives of global companies. As a follow up, AI Trends is producing a series of articles on AI initiatives in Canada centered around Toronto, Montreal, Edmonton and Vancouver. Watch this space.